I never plan to do anything to the bedroom for Christmas, but it never fails, I get inspired by something. 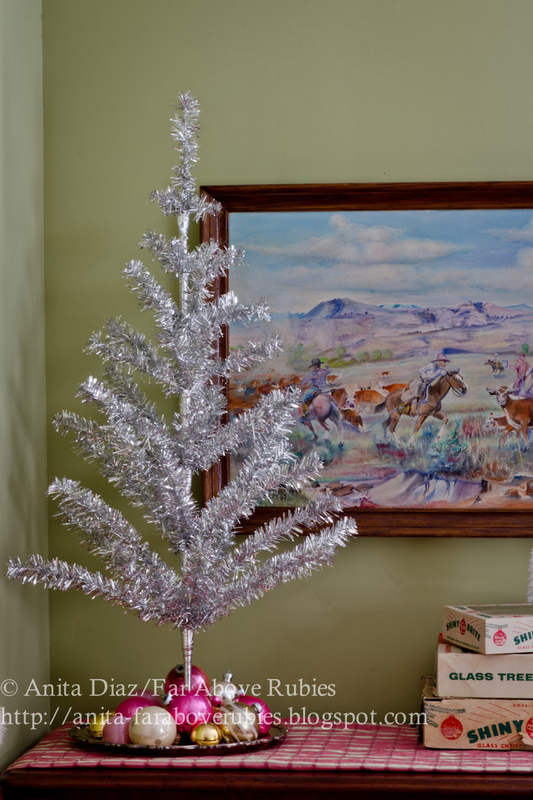 This year, I found myself obsessing over retro aluminum Christmas trees. I was not lucky enough to find an older one, maybe because they are highly collectible and expensive, but ran across this small one from the late 1980s, and it works for me! Since the walls are green, I really didn't want to use more green, so this is just perfect, and adds some sparkle. 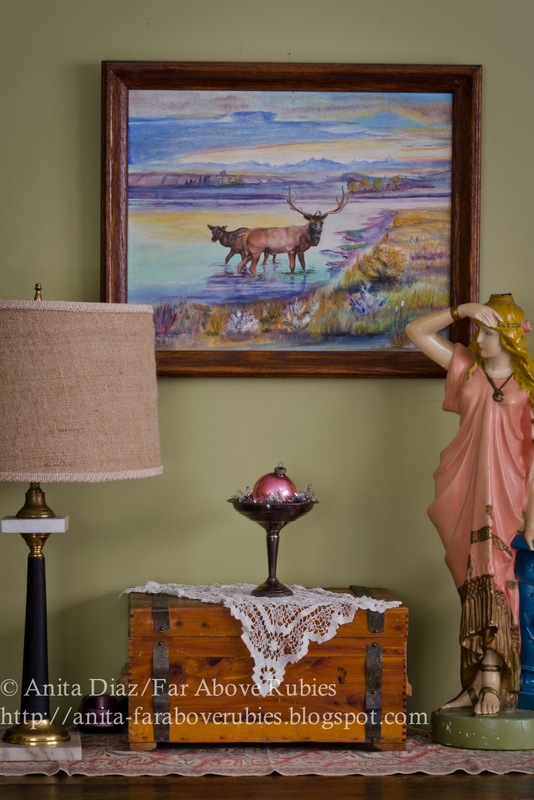 Everything on the dresser is vintage including the painting, an original by my late uncle, Montana native Rex Thrower who painted many beautiful western scenes. This one is from 1967 and certainly fits with my retro theme. 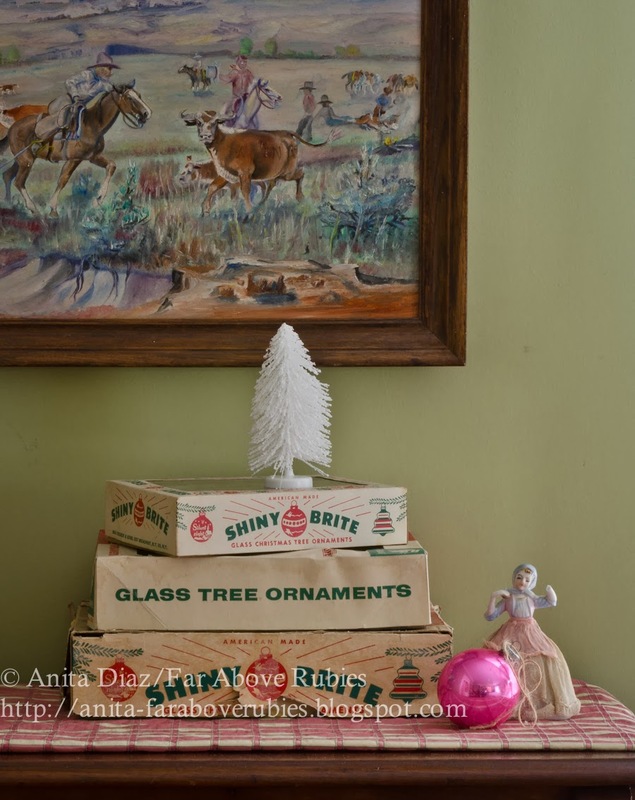 I left the tree unadorned, just placing some vintage Shiny Brite ornaments in a silver tray. 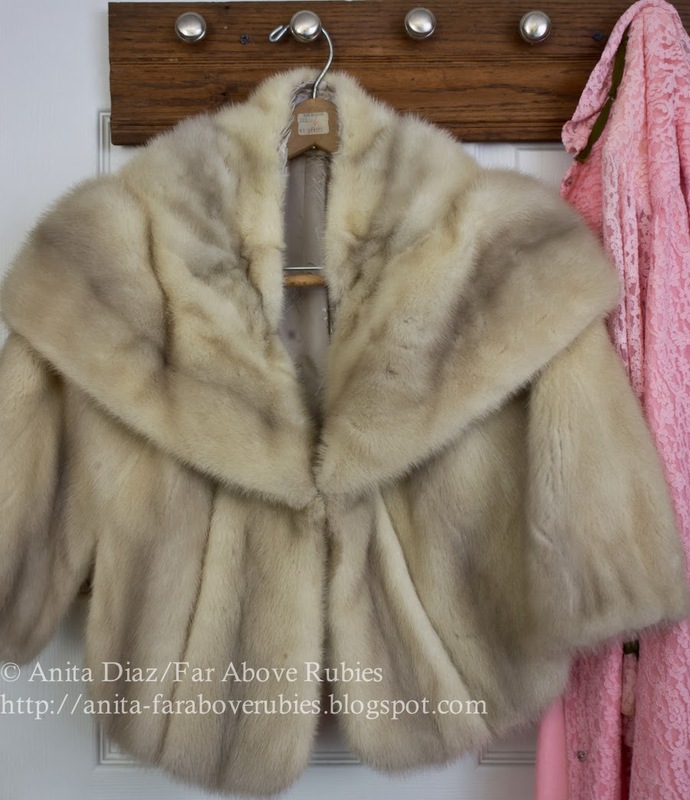 I inherited the vintage mink cape from a relative and thought it would, again, be a reminder of days gone by. Another original painting from 1965 takes center stage above my great grandfather's drop leaf table. A lamp my grandmother painted, and vintage wood box all sitting on an antique scarf from Iran. 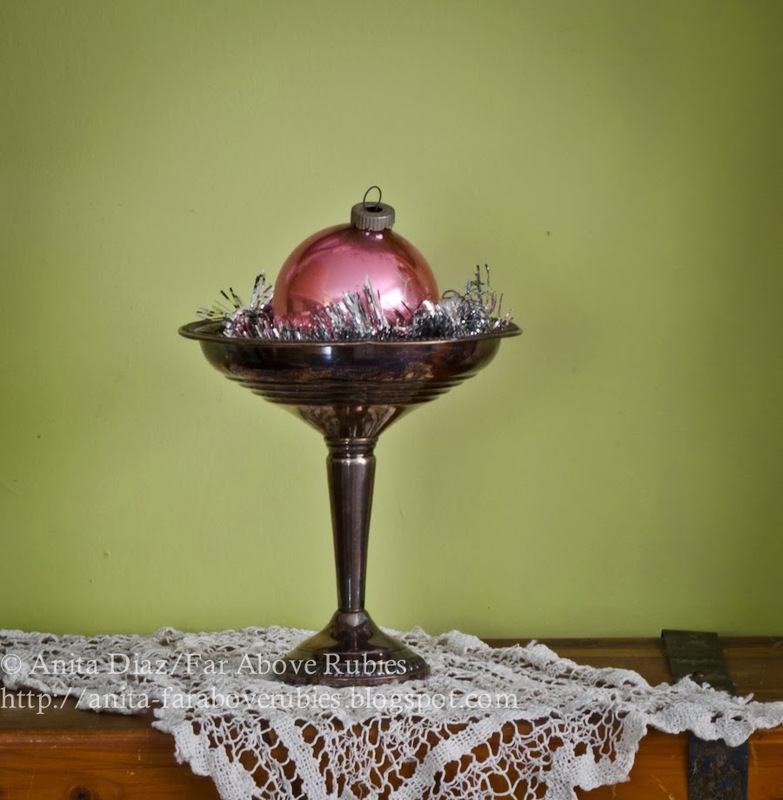 Vintage Shiny Brite and tinsel snuggle in an antique sterling compote. 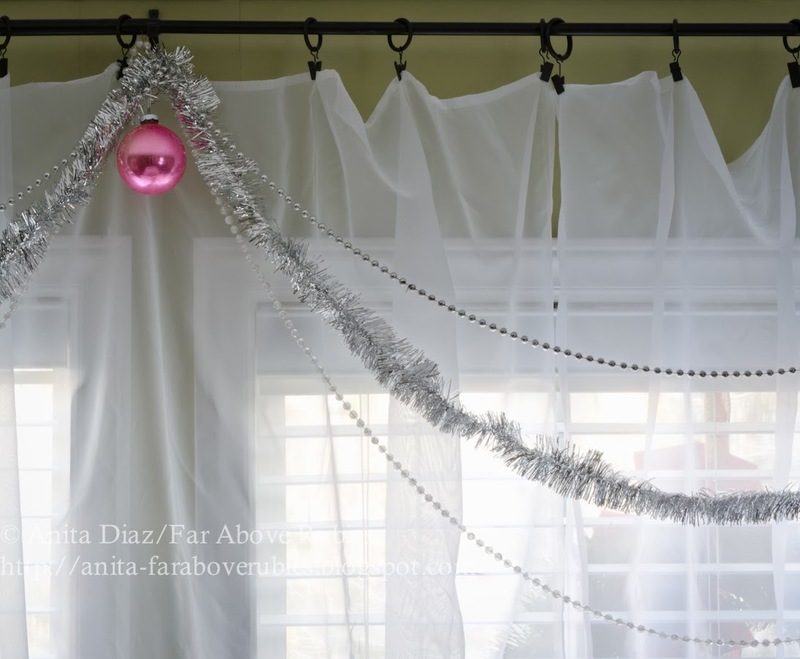 I simply draped tinsel with silver and pearl beads, accented with a pink Shiny Brite ornament behind the bed. I thought it was sweet, but my dear husband thought it just might be too girly, lol. I am still loving the antique iron bed I restored this spring. I have not, however, been happy with the height of the mattress because I think it looks too modern, and the bed is just too high. Well, my mother apparently agreed with me and bought us a smaller size box springs for Christmas which will be delivered today, lol! See, I am so practical that way:-) I can't wait to see how it looks. I'd love to have a down mattress topper now too. Just a few retro touches give the bedroom a more nostalgic feel. And isn't that what we all want at Christmas? How sweet, Anita! I would so enjoy a night in this room! Funny thing is, I remember my grandmother's beds being really high. I loved running and jumping to get in! This room looks so warm and cozy. Perfect! ANITA, Merry Christmas and a delightful December month to you. Wow! Makes me think of times of less stress and more family. Exactly what I strive for. Luv it! Anita, we just need to go back in time don't we? I love the simple touches you added and with everything else you have, it all just goes so well together. If things were only like they used to be, I think we'd be a lot better off. 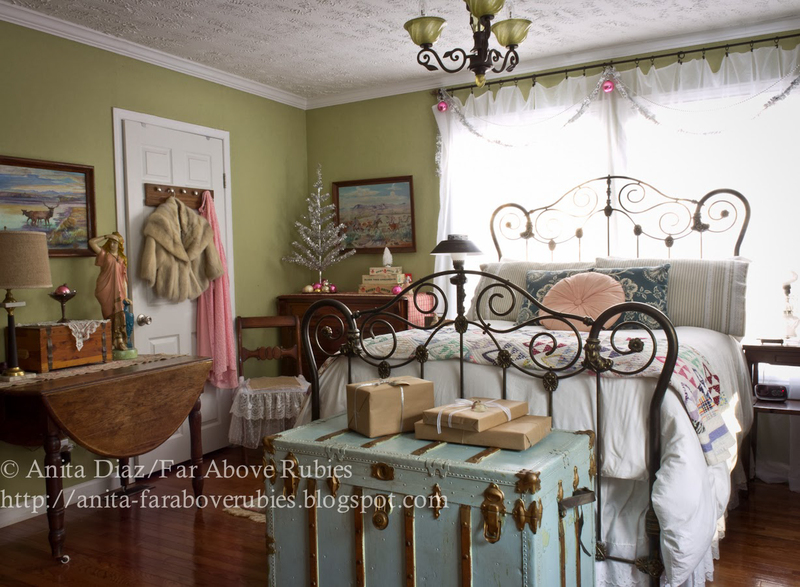 Marry Christmas to you and I love your bedroom! Your bedroom is beautiful. It's a sweet tree. 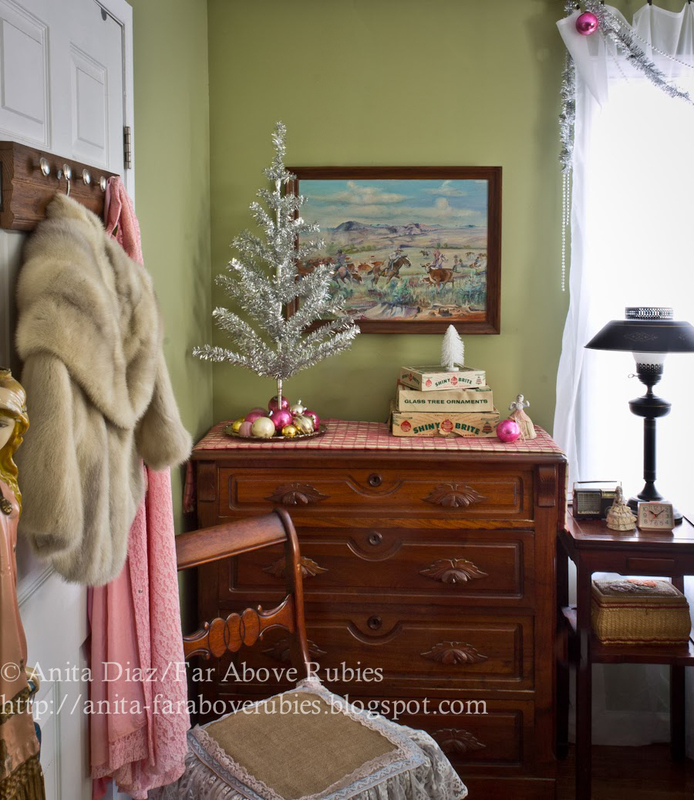 Love the tree and the mink stole. 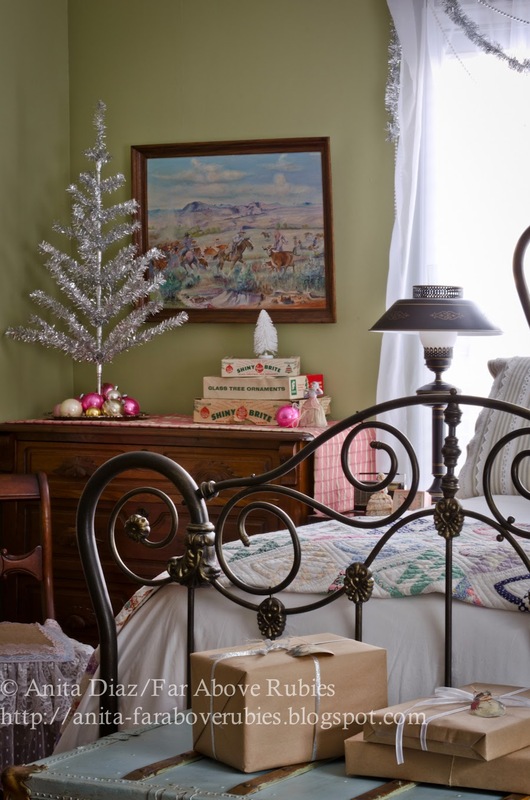 The perfect touches to make your room cozy and sparkle for the holidays. I've been trying to talk my girls into a tinsel tree, I'll have to show them your photos to help sway them. 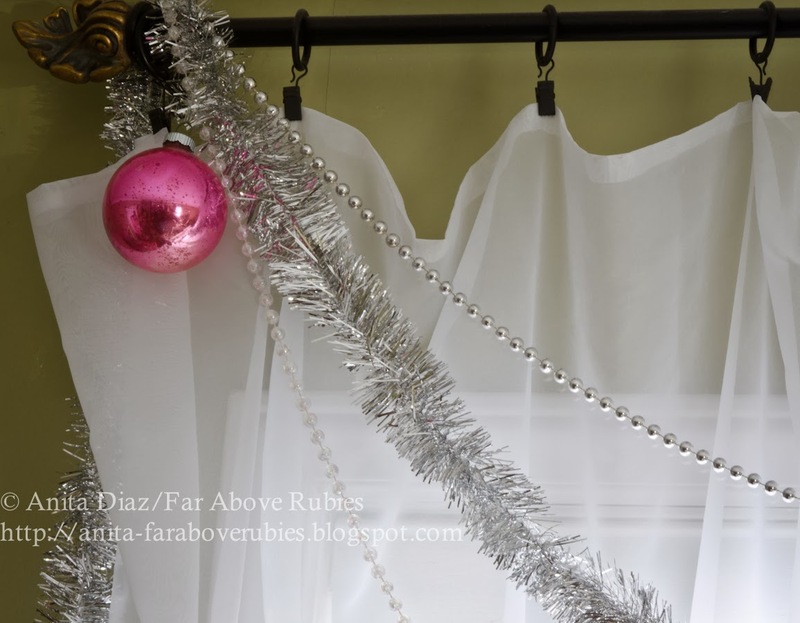 Oh I love the window garland with the pink ornaments! Shiny Brite old ornaments are simply the best vintage ornaments and I adore them. Sorry I'm so long in reading. These decorations are exactly what I'd love to have in my pink room. 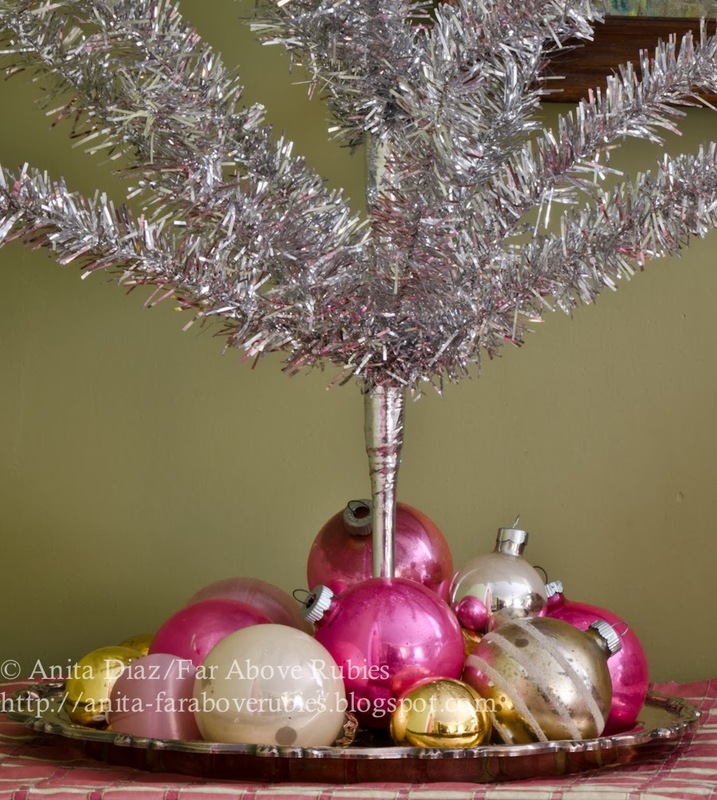 Love the aluminum tree on the silver tray and the simple pink ball on the silver compote. I am now in search of some vintage ornaments for next year! thanks for the inspiration.